It’s September folks! That’s the same month that JavaOne starts! We’re well and truly getting into the final countdown for JavaOne now – I hope people are starting to get prepared. I wish I could say I was more prepared than I am, but I’m sure I’ll get there in time. Anyway, a good set of links this week, so enjoy! Given we’re only a few weeks out from JavaOne, I’ve started publishing short interviews with some people who will be presenting. So far I have interviews with Eugene Ryzhikov, Mikael Grev, and Stephen Chin. I’ll be publishing more in the lead-up to JavaOne. Speaking of JavaOne, people are starting to post summaries of what they will be presenting at JavaOne. I’ll post links to these whenever I find them. This week Adam Bien, Hendrik Ebbers and I have posted our JavaOne talks. I’m arranging the 5th annual Java desktop lunch. If you’re going to be at JavaOne and want to come along, please register your interest now so that I can be in touch with the details. Adam Bien recently presented to the Virtual JUG on the topic of ‘Opinionated JavaFX‘, where he spoke about how he recommends building JavaFX applications, behind the scenes of afterburner.fx and finally he gave a walk through of floyd. Jens Deters has announced that MQTT.fx 0.0.7 has been released. This release includes ‘scripting support, setup/re-configuration tool, a reviewed connection profile editor, and a reviewed UI and style’. It’s looking very nice. Jens Deters has also announced the release of FontAwesomeFX 8.0.9, which includes support for 40 additional icons from FontAwesome 4.2.0. Hendrik Ebbers has posted more screenshots of the AeroFX project that is being undertaken by Matthias Meidinger. It’s looking good! I’ve got no involvement (or really even any interest) in Bitcoin at present, but I thought it was cool to come across Bitsquare this week, which has a nice looking client written in JavaFX (scroll down to watch the video). The code appears to be open source too. Good stuff! Hi there. Thanks for taking the time to do this quick interview. Can you please introduce yourself? 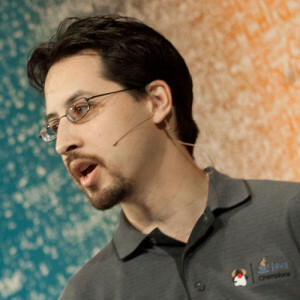 Is this your first time presenting at JavaOne, or are you a JavaOne veteran? Longtime attendee, pretty longtime speaker (and occasional Rock Star Speaker). What are you going to talk about at JavaOne? That is a great question that I am trying to avoid thinking about myself as I continue to lie to myself that preparation won’t be as horrendous as last year, and procrastinate away! If I were to actually think about it, I might remember that I am going to do a UI mashup to show off the new Date and Time API, hack on some wearable embedded devices in a cool lab, and even perform a magic show. Heck, I would even throw in an Agile talk for the brand new track we are kicking off, and do NightHacking interviews all afternoon in the Java Hub with notorious Java geeks. I definitely don’t want to talk about other stuff I am helping out with like the new Embedded Device Showcase, Keynote Demos, or OTN Lab [where the 3D printer will live for the week], because that would further reinforce how badly behind I am on prep. It is a good thing that I will forget about this interview right afterwards. Thanks for taking time out of your day to answer these questions! All the best for your JavaOne talks! I have been in the Java ecosystem since Swing was a newborn. I work with many different things, some of which include creating Android apps (one Google Now competitor soon to be released), conceptual design for fighter aircraft systems, client application development/architecture and creating components/widgets in Swing and now JavaFX. Much API, UI/UX design and performance work, less web crap. I’m a geek from very young age, I started programming my C-64 when I was ten (according to mom). Then I had a slight detour into piloting fighter jets for 17 years until I two years ago went back to being a full time computer geek and API snob. I collect pixels and have many of them in use and I set an alarm to go to bed in the evening. The session name “Create JavaFX Layouts Like a Boss” pretty much gives it away. I will focus on MigLayout as the tool, which I and Tom Eugelink has now readied for JavaFX 8. There will be a lot of general advice on how to make scalable and beautiful layouts. The intention is to raise the general – not-so-interested-about-visuals- developer well above ugly layouts without additional work. It will be fast-paced so don’t come there without ++coffee in your veins. Do you have any big announcements or releases planned leading up to (or at) JavaOne? Can you give any hints? I hope I will. Given the move towards simpler – and in that somewhat harder to figure out – GUI:s, it is recommended that one use subtle animations to convey intent. Animation is a great way to help the end user on the path to understanding the flow of your app. Unfortunately it’s not that easy to do UX-centric animations manually, even when the animation itself – the moving/fading part – is managed by the framework, like in JavaFX. My goal is to enable good looking animated transitions between layout changes just by adding the keyword “animate” to MigLayout. In >= 60fps. If I can’t make it ready in time I will pretend to faint 42 minutes into the presentation. My session might be funny. So come by if you like that kind of thing. If you don’t like funny, come by anyway and not laugh. My name is Eugene Ryzhikov. I’m a software architect at NextEra Energy in sunny Florida. 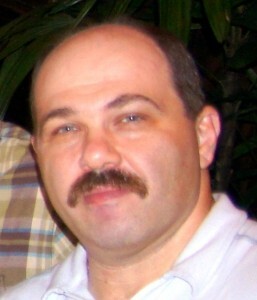 I’ve been involved with software development for at least 25 years now and still enjoying it! I work with a lot of programming languages but most of my time is spent doing Java and Scala. In the last 1.5 years I’ve been involved in ControlsFX project with Jonathan Giles. I’ve attended JavaOne may times, but never presented. Java One 2014 will be special – I will see the conference from the (unusual for me) speaker point of view. Together with Jonathan we are going to talk about the ControlsFX library. We’ll examine many features, both old and new, show how to use it in your applications and provide some insights into the future plans. I’ve been involved in open source projects for many years now, but I’m still amazed at what happens when many people come together to achieve some kind of goal. This is what is happening in ControlsFX now. We have approximately 55 committers, people who are passionate about JavaFX controls, and want to make a difference. They are an unstoppable driving force behind the library now, to the point that sometimes it is difficult to keep up with all the progress 🙂 This is amazing to watch and be part of. Thanks Eugene – see you at JavaOne! I rolled out yet another Scenic View 8.0.0 developer preview build to get more feedback. This build included subscene support, hugely improved linux support, and some support for running Scenic View as an agent again (although I’m told it isn’t perfect yet). There will probably be another Scenic View developer preview build again this week as I work towards a final release (most probably this side of JavaOne). Matthias Meidinger has put up a website for AeroFX, his JavaFX stylesheet that attempts to bring the Windows 7 style to JavaFX. It’s looking excellent so far – you can see screenshots on the github page. Dirk Lemmermann put up two more tips this week. Tip #13 is to study the Modena CSS file, and tip #14 is about StackPane children, or as he puts it, ‘hidden but not gone’. I should note that in this case, Gilberto has some excellent advice – use the managed property on the children node that you do not want to include in the layout. This is by far the most optimal approach, rather than adding / removing children from the scenegraph. Nick Sabey has posted about ‘NASA Conjunction Assessment with JavaFX and the NetBeans Platform‘. Jens Deters has posted a ‘poor mans input constraints‘ implementation. I’m also very happy to note that his main complaint – a lack of a ‘JFormattedText’ control in JavaFX will be resolved in JavaFX 8u40, as already the TextField control has been improved to support formatted text input (see RT-14000). The IDR Solutions blog has a post on how to mix TreeView nodes in JavaFX. Niels Gundermann has posted update 10 of his JavaFX 3D editor. William Antônio has posted part four of his series on JavaEE, JavaFX and RFID.